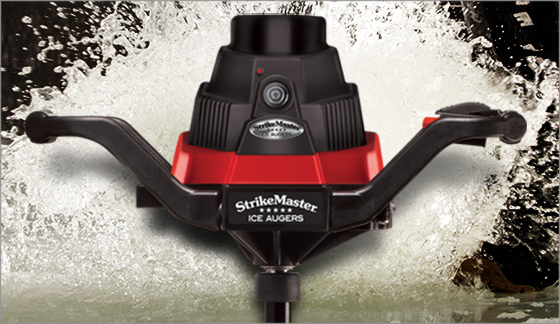 Harnessing the most modern technology available, the new StrikeMaster® Lithium Lazer auger can cut an amazing 56 holes through 2 feet of ice on a single charge. Call it the Little Lithium Auger That Could. With a removable 50-volt Lithium Ion battery under the hood, the Lithium Lazer provides consistent speed and torque from hole to hole without reduced power or slow-down from waning battery. Built on a proven StrikeMaster 25:1 transmission with heat-treated steel gears and polymer gear casting, the Lithium Lazer delivers maximum efficiency with a lighter weight than ever before. Fitted with twin 8-inch, Swedish-made Mora™ stainless steel Lazer blades, it weighs in at only 24 pounds. Featuring an on-board indicator for easy battery level checks, the Lithium Lazer comes with a fast-charging, two-hour, two-amp battery charger. “So you can be back up and running in two hours on a completely dead battery,” Roach explains. An over-sized throttle makes the Lithium Lazer easy to operate with gloves on, while VANDAR® long-filament high-impact handles make for comfortable operation for anglers who spend long days on the ice. The Lithium Lazer comes with a limited three-year warranty on its motor and a limited one-year warranty on its battery. This entry was posted in News, Products and tagged Lithium Lazer, StrikeMaster, Tony Roach. Bookmark the permalink.